Schwab Strategic Trust (the Trust) is an open-end management investment company. The Trust's portfolio of funds include Schwab U.S. REIT ETF, Schwab U.S. Broad Market ETF, Schwab U.S. Large-Cap ETF, Schwab U.S. Large-Cap Growth ETF, Schwab U.S. Large-Cap Value ETF, Schwab U.S. Mid-Cap ETF, Schwab U.S. Small-Cap ETF, Schwab U.S. Dividend Equity ETF, Schwab International Equity ETF, Schwab International Small-Cap Equity ETF, Schwab Emerging Markets Equity ETF, Schwab U.S. TIPS ETF, Schwab Short-Term U.S. Treasury ETF, Schwab Intermediate-Term U.S. Treasury ETF, Schwab U.S. Aggregate Bond ETF, Schwab Fundamental U.S. Broad Market Index ETF, Schwab Fundamental U.S. Large Company Index ETF, Schwab Fundamental U.S. Small Company Index ETF, Schwab Fundamental International Large Company Index ETF, Schwab Fundamental International Small Company Index ETF and Schwab Fundamental Emerging Markets Large Company Index ETF. Sign-up to receive the latest news and ratings for SCHF and its competitors with MarketBeat's FREE daily newsletter. What is Schwab International Equity ETF's stock symbol? Schwab International Equity ETF trades on the New York Stock Exchange (NYSE)ARCA under the ticker symbol "SCHF." How often does Schwab International Equity ETF pay dividends? What is the dividend yield for Schwab International Equity ETF? Schwab International Equity ETF announced an annual dividend on Wednesday, December 12th. Investors of record on Thursday, December 13th will be given a dividend of $0.8678 per share on Monday, December 17th. This represents a yield of 2.96%. The ex-dividend date of this dividend is Wednesday, December 12th. This is a boost from Schwab International Equity ETF's previous annual dividend of $0.80. View Schwab International Equity ETF's Dividend History. Has Schwab International Equity ETF been receiving favorable news coverage? 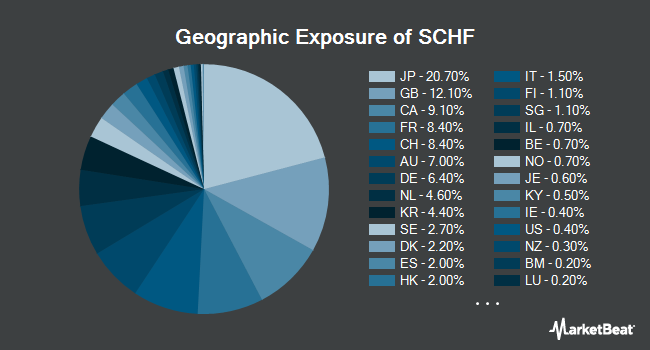 News coverage about SCHF stock has trended positive on Saturday, according to InfoTrie. InfoTrie rates the sentiment of news coverage by monitoring more than six thousand blog and news sources in real-time. The firm ranks coverage of companies on a scale of negative five to positive five, with scores closest to five being the most favorable. Schwab International Equity ETF earned a coverage optimism score of 2.6 on InfoTrie's scale. They also gave news coverage about the company a news buzz of 3.0 out of 10, indicating that recent news coverage is unlikely to have an impact on the stock's share price in the near term. Are investors shorting Schwab International Equity ETF? Schwab International Equity ETF saw a increase in short interest in March. As of March 29th, there was short interest totalling 2,651,574 shares, an increase of 127.2% from the March 15th total of 1,167,177 shares. Based on an average daily volume of 3,055,204 shares, the short-interest ratio is presently 0.9 days. View Schwab International Equity ETF's Current Options Chain. What other stocks do shareholders of Schwab International Equity ETF own? Based on aggregate information from My MarketBeat watchlists, some companies that other Schwab International Equity ETF investors own include Exxon Mobil (XOM), AT&T (T), Thermo Fisher Scientific (TMO), eBay (EBAY), Vodafone Group (VOD), Becton Dickinson and (BDX), Walt Disney (DIS), Corning (GLW), Home Depot (HD) and Johnson & Johnson (JNJ). Who are Schwab International Equity ETF's major shareholders? Schwab International Equity ETF's stock is owned by many different of retail and institutional investors. Top institutional shareholders include Betterment LLC (2.79%), Gemmer Asset Management LLC (0.22%), TD Ameritrade Trust Co (0.20%), Wooster Corthell Wealth Management Inc. (0.16%), Coastal Capital Group Inc. (0.13%) and Evergreen Advisors LLC (0.12%). Which major investors are selling Schwab International Equity ETF stock? 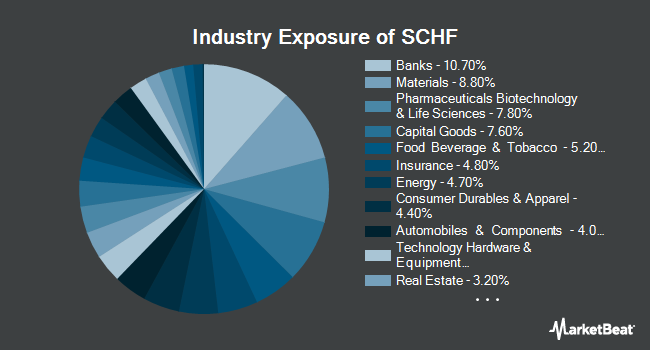 SCHF stock was sold by a variety of institutional investors in the last quarter, including Cliftonlarsonallen Wealth Advisors LLC, Cliftonlarsonallen Wealth Advisors LLC, Sharkey Howes & Javer, Bank of The West, Steinberg Global Asset Management, Newman Dignan & Sheerar Inc., Huber Financial Advisors LLC and Shine Investment Advisory Services Inc.. Which major investors are buying Schwab International Equity ETF stock? SCHF stock was acquired by a variety of institutional investors in the last quarter, including Coastal Capital Group Inc., Betterment LLC, Cohen Klingenstein LLC, Appleton Partners Inc. MA, MorganRosel Wealth Management LLC, Cypress Wealth Services LLC, Bogart Wealth LLC and Evergreen Advisors LLC. How do I buy shares of Schwab International Equity ETF? 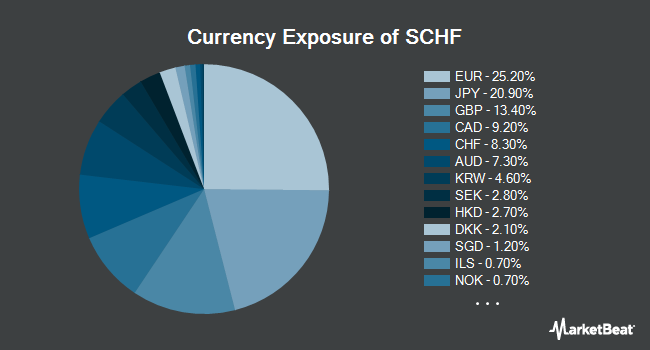 Shares of SCHF can be purchased through any online brokerage account. Popular online brokerages with access to the U.S. stock market include Vanguard Brokerage Services, TD Ameritrade, E*TRADE, Scottrade, Fidelity and Charles Schwab. What is Schwab International Equity ETF's stock price today? One share of SCHF stock can currently be purchased for approximately $32.21. 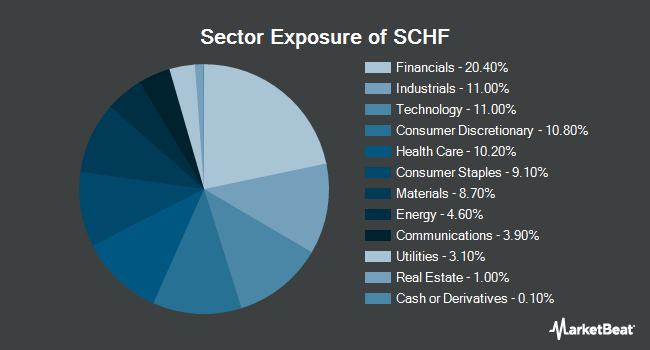 How big of a company is Schwab International Equity ETF? Schwab International Equity ETF has a market capitalization of $17.65 billion. How can I contact Schwab International Equity ETF? Schwab International Equity ETF's mailing address is 211 Main St, SAN FRANCISCO, CA 94105, United States. The company can be reached via phone at +1-415-6677000. MarketBeat's community ratings are surveys of what our community members think about Schwab International Equity ETF and other stocks. Vote "Outperform" if you believe SCHF will outperform the S&P 500 over the long term. Vote "Underperform" if you believe SCHF will underperform the S&P 500 over the long term. You may vote once every thirty days.